Boy, do I love snow! I know you saw the photos Mom took of me. When I got home I stretched out as long as I could & laid right down in it. That felt so good. Enough about snow. This month is another first for me. It will be my first Christmas. Grandma made me my own stocking & hung it up here in the Shop. It has Rudolph the Red Nosed Reindeer on it. We have a panel with several Rudolph stockings on it & a panel with two big stockings on it. Remember, we have a Christmas gift list you can sign up for so your family and friends can stop in & get your Christmas present. All you have to do is as for an index card, put your name on it & write down what you want. We will file it & have it on hand for your loved ones to use as a reference. We will be having a Men's Night on Friday, December 12th from 6pm-8pm so your fella can come in, give me belly rubs & get your Christmas presents. We will have cookies & beverages for them to munch on while they shop. Mom & Grandma will be on hand to help them pick out good gifts & to go over your list with them. So, don't forget to come in and fill out your Wish List for Santa. We have Gift Certificates available, too. On Saturday, December 13th, take a break from the Christmas stress & decompress with a class. 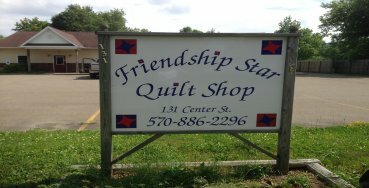 Linda Mitchell will be teaching the 3 Hour Quilt from 10a-3p. Class fee is $49.00. This is a great way to relax & take time for yourself before the Holiday Stress begins. Personally, as a dog, I don't have any Holiday Stress. I'm not even sure what it is but Mom said to mention it. 20% Off Blender fabrics & Notions. We have a lot of nifty little gadgets & gifts for Secret Santas. Starting in January, Mom & Judy Snyder will be teaching a Mystery Quilt. It will be great fun. It starts on January 17th. I will get you more details when they come available. They haven't filled me in on it, yet. But as I get some tidbits, I'll past them along. We now carry minky fabric & have a new Disney Frozen fleece that just came in this weekend. Triangle Frenzy Swirl pattern and Steam A Seam 2 is back in. I hear the kitchen door, treat time! Gotta go! Oh yeah, Maryanne & Mary Lou, too.